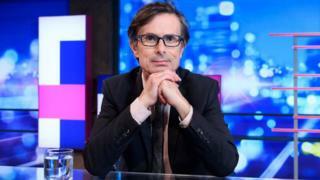 Broadcaster Robert Peston has spoken about feeling “desperately guilty” after falling in love with another woman years after his wife’s death. The ITV political editor’s wife, writer Sian Busby, died of lung cancer in September 2012, aged 51. In an interview with the Sunday Times magazine, Peston – who is now in a new relationship – said he had discussed his guilt with a grief counsellor. He said other “predatory” women had targeted him after his wife died. Speaking to the Sunday Times, Peston, 58, said he was now in a relationship with Charlotte Edwardes, diary editor of London’s Evening Standard. Peston has spoken previously about how novelist Busby died in his arms, five years after being diagnosed with lung cancer. The couple were married for 14 years and had one son together. The presenter also spoke about how women targeted him after he became a widower. “Women are predatory towards me,” he told the magazine. The former BBC business editor said he met Edwardes at a Christmas party, having briefly worked together in the past. He said his new partner was “not remotely interested in me as a widower or because of what I do for a living”. “She was the only person that I came across around that period who literally knew almost nothing about the BBC stuff or Sian or anything,” he added. Peston worked at the Daily Telegraph before joining the BBC, where he covered the financial crisis and broke the story about the collapse of Northern Rock in 2007.